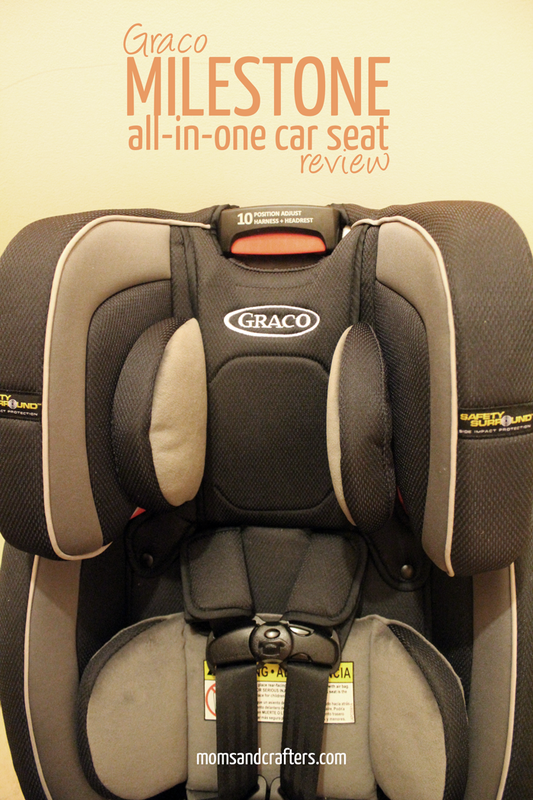 Welcome to my Graco Milestone car seat review, featuring the Milestone All-in-One Car Seat with Safety Surround! For those of you who don’t know yet, I am very into car seat safety, ever since our little scare a year ago. Our tall boy was about to outgrow rear facing in our old convertible, and he was only just approaching eighteen months. The AAP recommends toddlers to rear face AT LEAST until age two, or until they outgrow the maximum height and weight on the car seat. 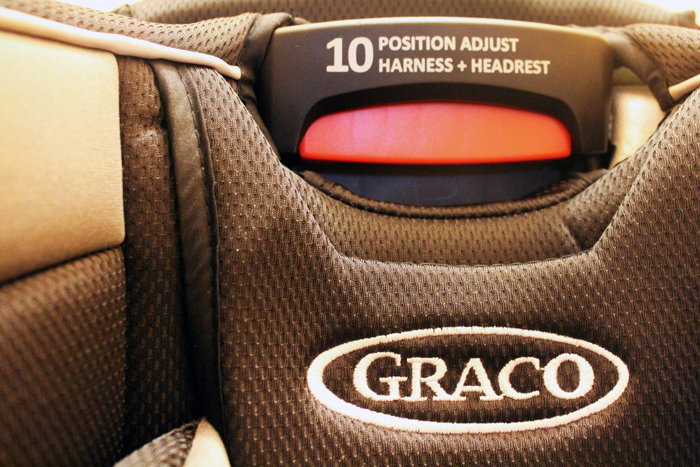 When Graco contacted me to review their Milestone All-In-One car seat with Safety Surround, I was delighted. I will be offering my review based on two factors: 1. 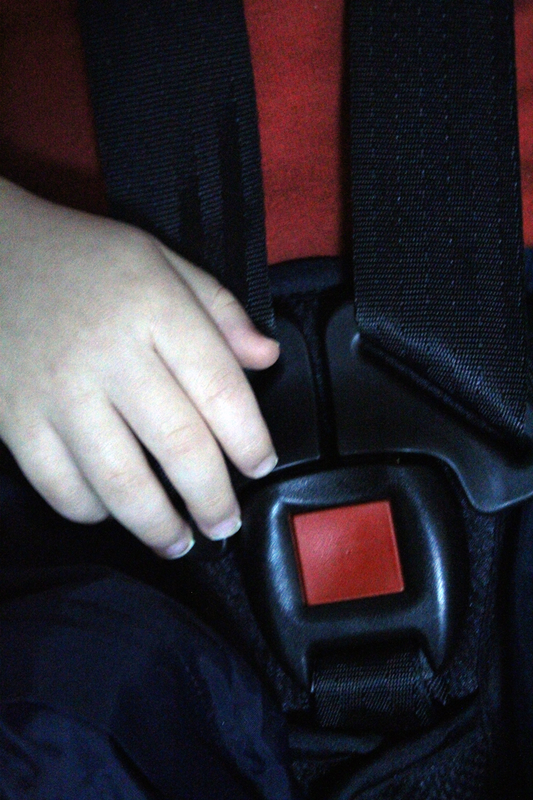 Car seat safety and the usability in accordance with the rules, and 2. convenience of features. 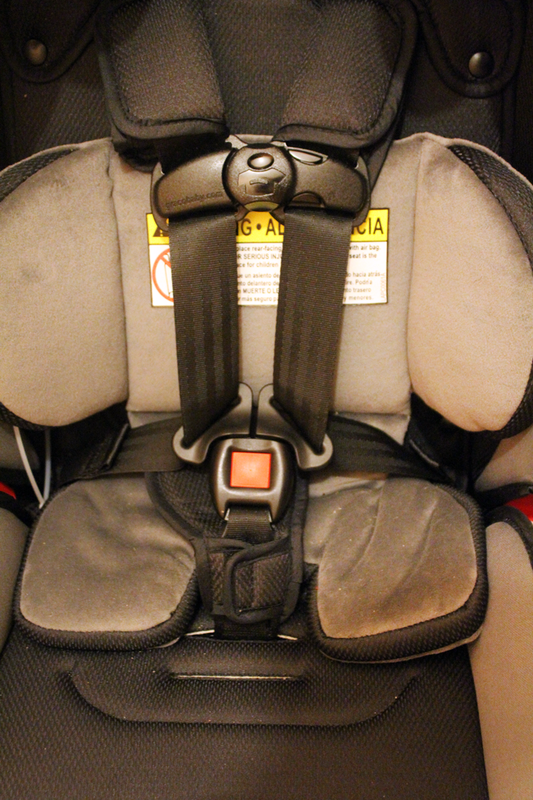 Rear-facing infant car seat from 5–40 lb, and while head is at least 1 inch below the red handle. Simply Safe Adjust™ Harness System for changing back height and harness position. Certified for use on airplanes when used with the 5 point harness. Expires 10 years after manufacture. This car seat is a far cry from any other I’ve had in ease of use. It’s super-simple to adjust the back and the harness using the red handle by the head. . 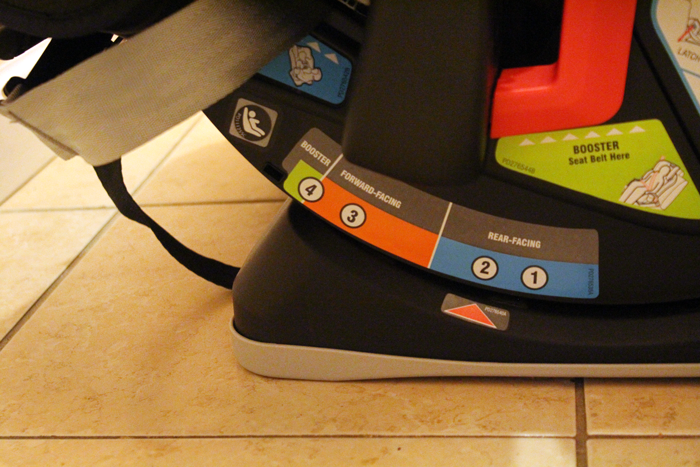 This makes it more convenient, and also more likely that the harness height well be properly adjusted when baby grows, giving it a few points in the safety category. The multiple recline positions means that even while rear facing M can go to sleep or sit up and see the world. All along the car seat are clear stickers with visible instructions (in both English and Spanish) to make safe installation more likely. It’s easy to adjust between recline positions, using another red handle, again making a safe install more likely. 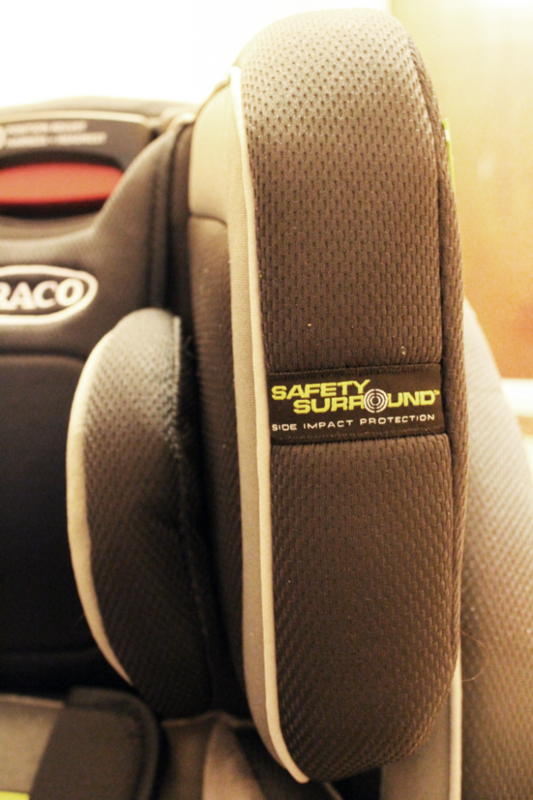 The Safety Surround design offers side impact protection. Our accident a year ago was a side-impact crash, so this feature is a definite must for me. I also love the extra head support and comfort it provides M with. The (removable) cushion as well provides extra comfort. We often travel two hours to visit my parents in New Jersey. With traffic it can take three or more hours, and it usually overlaps with M’s nap or bed time. Having a comfortable seat that he can sleep in is a major bonus for us, and will make the trip much more doable. 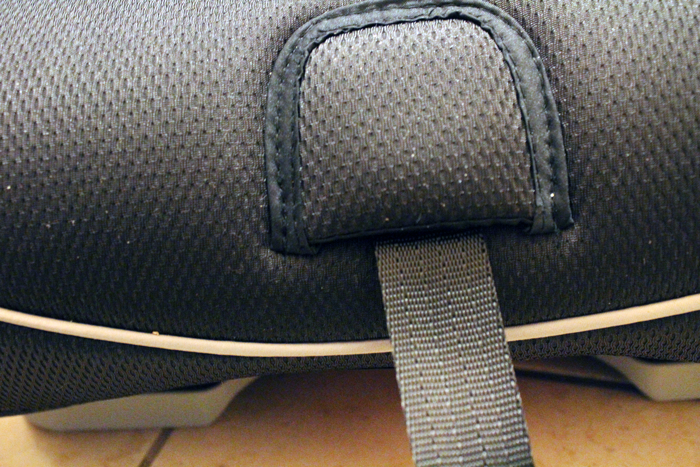 It was easy to readjust the position of the bottom half of the buckle, but not too easy. I don’t mind this, as it’s something that only needs to get done occasionally. You need to lift the entire seat pad, but from there, you don’t need to do major threading. Tightening the harness is very easy – you simply pull on the strap at the bottom. 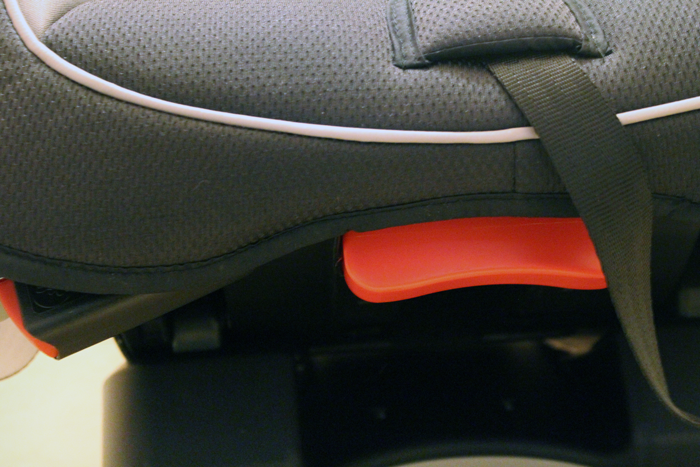 Loosening it is much harder (you need to remove the seat pad). This, to me is an advantage, as it helps discourage using a bulky coat in the winter, which is unsafe. It takes the same effort as re positioning the bottom half of the harness, which is only done on occasion, when the child really grows. 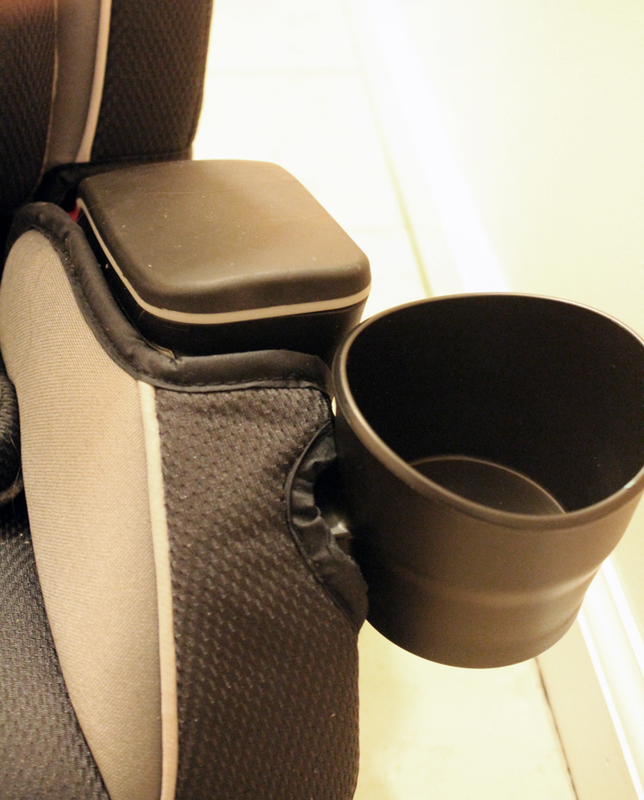 It has a built-in, removable cup holder – yay! That is such a simple and basic feature that we have been sorely missing. On the first two tries I had a really hard time opening the chest clip. I was deliberating if this is an issue or not, as my tot loves opening buckles. I could just get a seat belt cutter (an essential for every car regardless) and be glad he won’t open this one. Then I tried again a third time. This time I tilted it slightly so that the front was facing upward. It slid right open. That means that in a pinch, I will not have trouble getting my baby out, but hopefully he will have a hard time figuring it out. 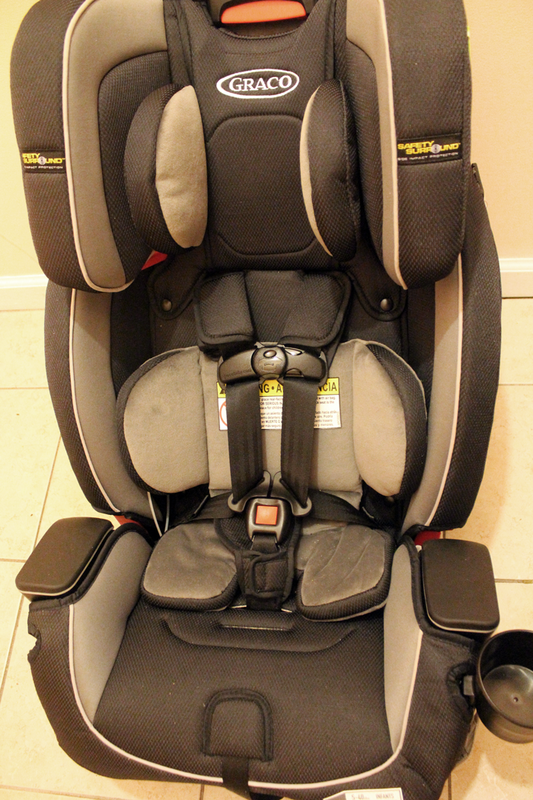 We will be using it on our upcoming trip to my parents and can’t wait for our first big ride in a comfy car seat. I would highly recommend it, and would definitely buy it if I were on the market. 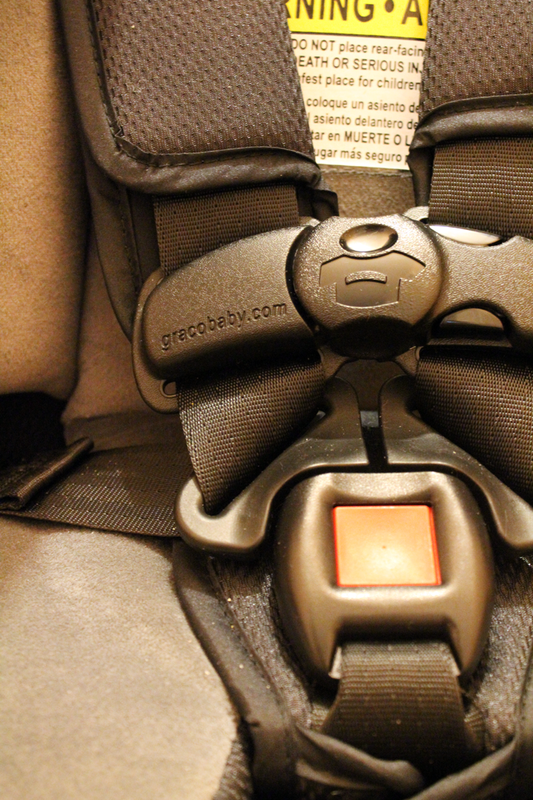 The buckle issue had me scared at first, but I can see that Graco has really made it easier (I am speaking as a customer of various brand car seat recalls). 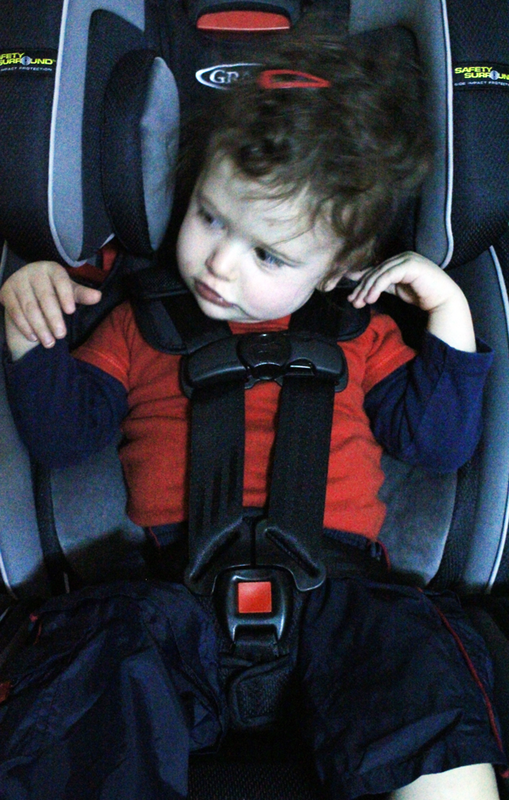 It’s not easy to get a safe install in general, and this car seat makes it easy. Bonus tip: Always read the car seat manual cover to cover. It contains valuable, potentially life-saving car seat safety information, and is one of the best ways to educate yourself. Disclaimer: I received a free sample in order to facilitate this review. No monetary compensation was received. All thoughts and opinions are my own and were not influenced in any way. I only review and endorse products I think highly of. This post contains affiliate links. Thanks so much for the review. I love the recline positions! This is a fantastic car seat. My niece is due in August and is looking for a car seat. I will be sure to pass this on to her. Thanks. Thank you for such a detailed review. I appreciate hearing what you liked and didn’t like first hand. I like the removable cup holder- easy to clean. I really enjoyed reading this review. I am looking to buy my brother a car seat for my nephew and this looks like a good choice. I recently purchased this seat for my 18 mo old, but am concerned about the harness release method. The release is pulled instead of pushed like other seats I have used. I worry she will be able to pull the release without my knowledge. Has anyone had this happen or would this be possible? Should I be worried or am I overreacting? We’ve been using this since this post has been published for over a year and a half now and haven’t had that issue yet. I can only share my personal experiences and since each child is different, if it concerns you, you should definitely keep an eye out. Hi Jen. As far as I know there is one recline position for forward facing. I use this in my second car now so that’s not very frequent, but I believe that’s the case.